The museum should not just be used as a general destination for school trips, like the zoo or theatre, it should also be seen as a foreign language learning location. You will find ideas for preparation and follow-up work for museum visits to use in German lessons here. The museum as a language-learning location is a place where teachers can allow their students to be active. Furthermore, German teaching in the museum can function as a driving force for general knowledge, helping children – and also young adults – to learn about the cultural programme in their city or local environment. New citizens in Germany can benefit from an opportunity like this because not only does it give them an understanding of their new living environment, it also challenges their language skills. Teachers can plan their lessons in the museum around hands-on experience. The sensory bag is particularly effective at increasing children’s interest. | Foto: © Goethe-Institut Georgia For example in the exhibition resources accompanying the works of the artist Pirosmani in the Georgian National Museum, learners can work out the vocabulary for food products using smell jars, or learn the names of different fruits by feeling a sensory bag. Actual objects serve as stimuli for speaking, discussing, evaluating and comparing. In the museum the focus is on language-oriented activities, discovery learning and self-regulation on the part of students. For example learners are able to gain an overview of the exhibition independently by searching for particular works, before addressing individual works more closely by means of a picture description. In this situation the teacher plays the role of moderator. (Gobiani et al 2012: 12). 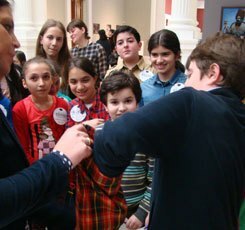 Thanks to the Deutsch lernen im Museum scheme, the language department at the Goethe-Institut in Georgia became involved with the museum project WHY MUSEUMS NOW in collaboration with the culture unit at the Georgian National Museum. German teachers joined forces with specialists at the National Museum, as well as with Erika Jäggi, an expert in museum-based education, to develop resources for German teaching in museums. 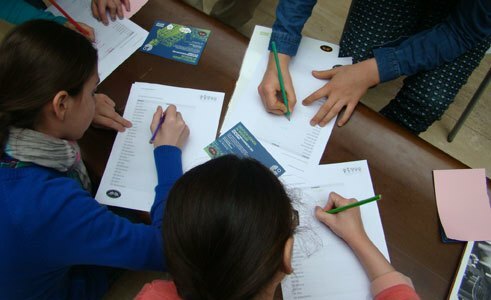 They created educational programmes for two of the permanent exhibitions in two museums in Tbilissi, in which students work on typical textbook themes like “Eating and drinking”, “Celebrating festivals” and “Status symbols”. Many German teachers now use these resources with their classes in the museums. The project now runs itself successfully. Teachers should choose permanent exhibitions for teaching visits, because they are available for longer. As teachers can use the material again and again, the effort required for preparation is within realistic limits. They should also opt for exhibitions that go well with the planned teaching material with regard to theme. Since the teachers are familiar with the theme and do not have to get to grips with completely new content, it makes it easier for them to access lessons of this type. Simply changing the learning location helps to arouse the learners’ curiosity and motivate them to tackle the themes. Of course you need to contact the museum in advance to check whether schools or other learner groups are welcome in the museum. As long as these boxes are checked, museums offer excellent opportunities for modern, action-focused German lessons. As well as observing the general regulations that always apply to lessons held outside school, it goes without saying that the teacher should research the exhibition in advance of the teaching visit. If the museum will be providing resources, the teacher should check whether they are suitable for the class. The teacher should make the group aware of behaviour rules applying to them all upon entering the museum. Below you will find a link to a downloadable document that will stimulate a discussion about what is and is not allowed. Obviously the structures are not set in stone, and sometimes they are open to flexible decisions. But explaining the rules has proved very productive when it comes to avoiding inappropriate behaviour in the museum and keeping other visitors as well as the hosts happy. Teachers should follow up every museum visit in the classroom, so that learners can ask any questions they still have and discuss their experiences. Classroom activities are also perfect for consolidating what they have learnt. This document provides ideas as to how the follow-up work could be structured. These days you need good reasons to embark on learning German, and in particular to kindle the interest of students in German. In this context, out-of-school learning locations such as the museum function in two ways: they motivate learners, and at the same time they raise awareness of learning German and the potential of German teaching to a wider audience. Gerlinde Massoudi is head of the language department at the Goethe-Institut Georgia.